Beth depends upon her parents and brother Scott for daily living, transportation and communication. She always had the desire to find a job, but she had limited employment experience; the last time Beth had worked was on a farm over 30 years ago. To get Beth started, her Division of Vocation Rehabilitation (DVR) counselor referred her to Goodwill’s Employment Services. This team finds opportunities and employment matches based on job openings and individual skill sets. Lisa Norman, a supervisor and employment specialist at Goodwill, worked with Beth to help her find competitive community employment. Part of the discovery process is meeting with the individual and family members to learn about the activities where they excel, in Beth’s case it was cleaning and walking her brother’s dogs. Lisa had worked with Debbie in the past through a program called Temporary Work Experience (TWE) and thought this placement might be a good fit. Debbie agreed to the TWE and Beth was excited about the opportunity. There was some job coaching to help evaluate Beth’s strengths and needs as well as determine how comfortable she was in this new job. 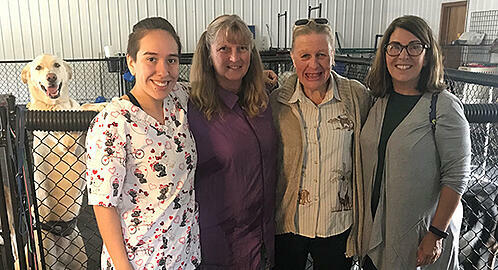 Debbie and Courtney, a supervisor at Wags & Bark, were both great resources for Beth and she began to flourish. According to Debbie and Courtney, Beth is dedicated and hard-working. This job at Wags & Bark provided her with a chance to work which gave her a special sense of purpose.